Finance and Operations had the highest participation increase. Representing that division were, from left, Jack Parker, Dennis Culak, Debbie Birdwell, Jacob Chandler, Anne Heartfield, Reneé Starns and Cynthia Bennett. That was the word Jim Gaertner, Sam Houston State University president, used to describe the success of this year's Faculty/Staff Annual Fund Campaign. "You don't know how unusual this is," Gaertner said in praising the university's 75.5 percent participation rate. "This shows what a special place this is, and what special people work here." 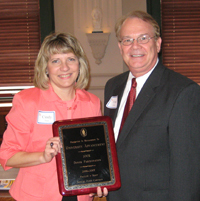 The College of Business Administration had the highest amount raised. Representing that division were, from left, Dean Lewis, Carol Shaw, Phillip Morris, Bill Green and Jim Bexley. Gaertner spoke to a recent gathering of campaign volunteers, during which awards were presented to divisions that had 100 percent participation, the one with the highest participation increase, and the one that raised the highest amount of money. Although the campaign will continue through the end of the year, through the active phase, which ended Nov. l6, a total of 1,186 donors gave or pledged $157,000, an increase over the 900 employees who contributed $146,000 last year through the same period. The number of donors increased by 32 percent and the contribution amount was an increase of 7.5 percent. By the end of the year last year, employees contributed almost $224,000. The College of Education had 100 percent participation. Representatives included, from left, Rosanne Keathley, Melinda Miller, Genevieve Brown, Sherry Hirsch, Debbie Allen, Randi Clower, and Mary Nichter. Jim Bexley, the campaign general chairman, announced the results, saying "we have nearly 200 more donors than at the end of last year." Rosanne Keathley, campaign faculty chair, mentioned some of the methods used by departments to encourage participation, such as an afternoon tea in the College of Education, breakfast and lunch meetings in the College of Criminal Justice, and a dunking booth run by Enrollment Management. Academic Affairs had 100 percent participation. 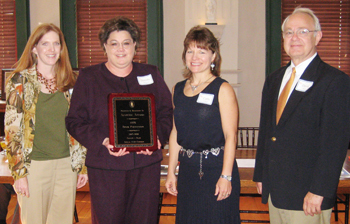 Representatives were, from left, Keri Rogers, Dorothy Roberson, Cathi Gillette and David Payne. 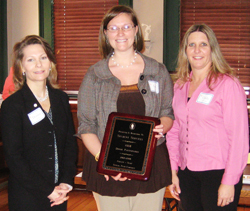 Sherry Henke, campaign staff chair, joined Bexley and Keathley in handing out the awards. 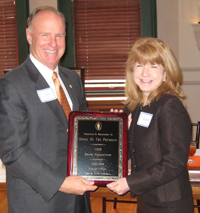 Overall coordinator for the campaign is Cindy Truax, SHSU director of annual giving. Henke said that not only are employees participating in greater numbers, but they are becoming more creative. Two divisions, Physical Plant and Enrollment Management, have set up scholarships for relatives of their employees. "They are supporting the annual fund AND helping students here at Sam," said Henke. Units with 100 percent participation included Academic Affairs, Student Services, the President's Office, the College of Education, and University Advancement. The unit with the highest participation increase, more than doubling their participation from 99 donors last year donors to 212 this year, was Finance and Operations. 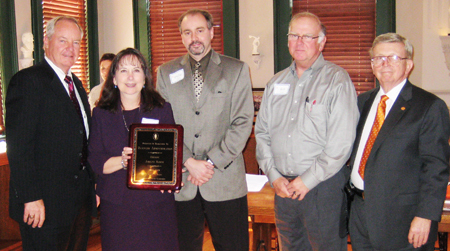 The College of Business Administration was recognized as the division with the most dollars raised--$34,905. The College of Arts and Sciences campaign committee was chaired by Dwayne Pavelock with members Mike Bankhead, David Burris, Max Coleman, Becky Finley, Marcus Gillespie, Chad Hargrave, Bobby Lane, Jennifer Pontius, Karen Whitney and Darren Williams. Student Services had 100 percent participation. Representatives were, from left, Donna Artho, Leah Mulligan and Cindy Allbright. The College of Business Administration committee was chaired by Bill Green with members Phillip Morris, John Newbold, Carol Shaw and Laura Sullivan. The College of Criminal Justice committee was chaired by Amanda Burris with members Ann Broussard, Doug Dretke, Janet Mullings and Shannon Murdock. The College of Education committee was chaired by Sherry Hirsch with members Debbie Allen, Randi Clower, Mark Gaus, Susan Hayes, Melinda Miller and Mary Nichter. The College of Humanities and Social Sciences committee was chaired by Donna Desforges with members Rosanne Barker, Gustie Callaway, Brenda Lowery, Mitzi Mahoney, Lee Miller, Kandi Tayebi and Janis White. The Academic Affairs committee was chaired by Dorothy Roberson with members Cathi Gillette and Keri Rogers. The Enrollment Management committee was chaired by Kerry Berry with members Vicki Barrilleaux, Lydia Hall and Denise Henry. The President's Office had 100 percent participation. Representatives were Jim Gaertner and Kathy Gilcrease. The Finance and Operations committee was chaired by Dennis Culak with members Cynthia Bennett, Debbie Birdwell, Jacob Chandler, Glenn Green, Anne Heartfield, Reneé Starns and Noelle Thompson. The Newton Gresham Library committee was chaired by Cheryl Spencer with member Marsha Dickens. The Advancement Office had 100 percent participation. Representatives were Cindy Truax and Frank Holmes. The President's Office committee was chaired by Kathy Gilcrease with member Bobby Jordan. The Student Services committee was chaired by Leah Mulligan with members Cindy Allbright and Donna Artho.